Technology has come a very long way over the last century, and there is no better proof of that than examining some of the insanely weird and stupid inventions of the 20th century. We don’t know what would motivate someone to build a device that allows a motorcycle to turn into a boat. And there’s no reason for a brush that shines someones balding head while combing their side hair. Yet many of these bizarre inventions actually went on sale to the public. In fact, a few of the devices were actually big hits at the time — that is, until consumers realized they were insane or just didn’t work as promised. Here are 20 of the weirdest inventions from history. FYI, #8 is a good way to unintentionally kill babies. 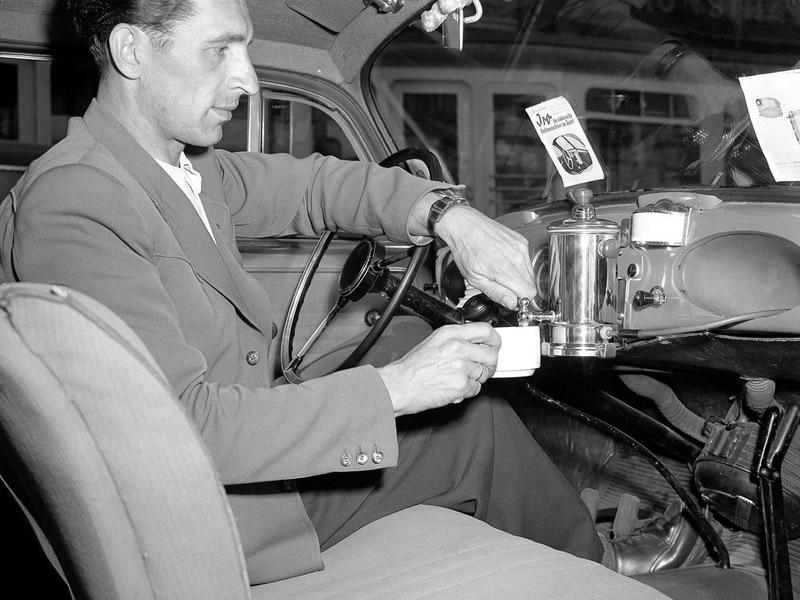 Make coffee in your car? Sorry, but we have the Starbucks drive-thru for that now. This seemed like a good idea on the surface, but boiling hot coffee while flying around at 65 miles per hour is not smart. Pouring a cup of coffee while driving is also not a very good idea — remember the McDonald’s lawsuit?